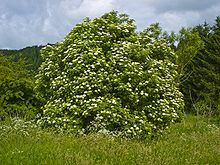 White heads of flowers in Spring up to 30cm across, which become large heads of berries that turn black and become editable in Summer. Winter dormant. Frost hardy. Drought resistant.